Kensuke Okabayashi is an award-winning professional artist. His work can be seen in everything from comic books to graphic novels to advertising storyboards. Okabayashi has taught illustration courses at Mercer College of New Jersey. Part I: Figure Drawing 101. Chapter 1: Welcome to the Joys of Figure Drawing. Chapter 2: Gathering the Goods for Figure Drawing. 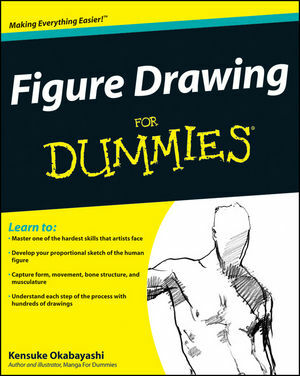 Chapter 3: Starting with Figure-Drawing Basics. Part II: Off to a Head Start. Chapter 4: Getting Inside the Head. Chapter 5: Adding Facial Features. Chapter 6: Going to the Top with Hair. Chapter 7: Presenting Emotions in Facial Features. Part III: Building the Body. Chapter 8: Examining Figure Proportions and Bone Structure. Chapter 9: Starting Simple with Stick Figures and Mannequins. Chapter 10: Pumping Up Those Muscles. Chapter 11: Drawing Figures in Motion. Part IV: Sharpening Your Figure-Drawing Skills. Chapter 12: Accessorizing Your Figures. Chapter 13: Taking Your Work to the Next Level with Advanced Drawing Techniques. Chapter 14: Working with Composition and Perspective. Chapter 15: Ten Places to Study and Draw the Figure. Chapter 16: Ten Ways to Organize, Store, and Present Your Work.